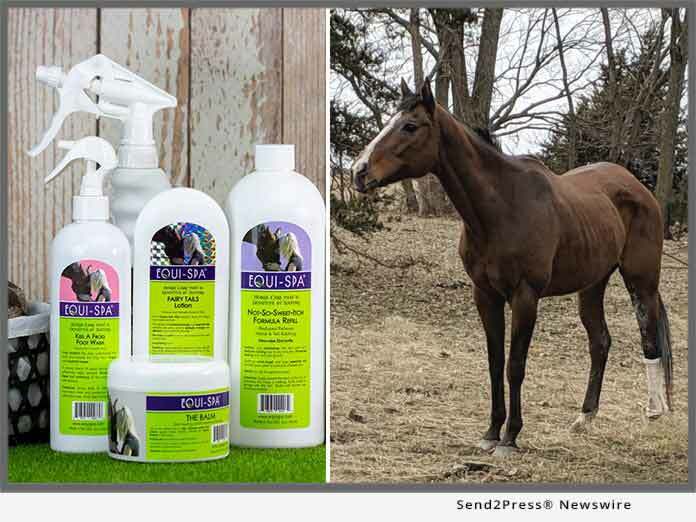 WINTERSET, Iowa, Mar 31, 2019 (SEND2PRESS NEWSWIRE) -- Equi-Spa(R), the leading maker of premium, all-natural horse care and equine grooming products based in Winterset, Iowa, announced today that it recently adopted a retired thoroughbred race horse in cooperation with the Neigh Savers Foundation. The plan is to provide this fabulous creature a "forever home" where she can live comfortably and with dignity for the rest of her life. Known by her race name, MS. Olympio, (Missy) is a special horse born into a long line of successful racers. She descends from Something Royal, mother to the legendary Secretariat. Missy was born in 2003 and made eleven starts on the race track, of which she earned two wins, and finished on the podium on four occasions. Missy retired in 2011 to become a brood mare. This past January, Neigh Savers, a non-profit organization that specializes in the rescue, care and adoption of horses that are struggling to find proper care in a suitable environment, reached out to Equi-Spa(R), looking for help finding a quality retirement home for Missy. Instead, Sherie Vermeer, owner and creator of Equi-Spa(R), decided to adopt the horse and bring her permanently to the Equi-Spa(R) ranch in Iowa. "I am not sure why, but I was immediately struck by Missy," said Sherie. "I love older horses and have plenty of room in my own barn for her." Missy's journey from champion to falling on hard times, is sadly a reality many working horses face as they move beyond their working life. Neigh Savers seeks to create new beginnings for these horses through retraining to allow them to successfully transition to a new career. Or, as in the case of an older horse like Missy, simply finding a caring home where they can retire in comfort. Since its inception in 2007, Neigh Savers has improved the lives of nearly 600 horses. Equi-Spa(R) has always believed in giving back to the horse industry and helping horses in need through select rescue services and other qualified horse care providers such as Neigh Savers and the Horse and Man Foundation. We encourage anyone who has the ability and passion for horses in need to please support these worthy causes. For the month of April 2019 we will be holding a fundraising sale for Neigh Savers. All Equi-Spa(R) products will be 20% off, and 10% of all profits for the month will be donated to the charity. In addition, to celebrate and welcome Missy to the family, Equi-Spa(R) will hold a huge giveaway to raffle away a valuable gift to one lucky winner. Equi-Spa(R) is a pioneer of spa quality, premium horse-care products formulated from all-natural ingredients and aromatic plant essences. The Equi-Spa grooming range combines the healing power of nature, and the principles of aromatherapy to benefit horse, rider, and the environment. Address: 2241 152nd Street, Winterset, Iowa 50273, United States.